Eagles running back Darren Sproles, who has missed most of the season due to injuries, warms up during practice at the NovaCare Complex in South Philadelphia on Thursday, Nov. 29, 2018. This time, the rare sight of Eagles running back and returner Darren Sproles stretching before practice with his teammates wasn't followed by any sort of announcement that Sproles reinjured his hamstring. 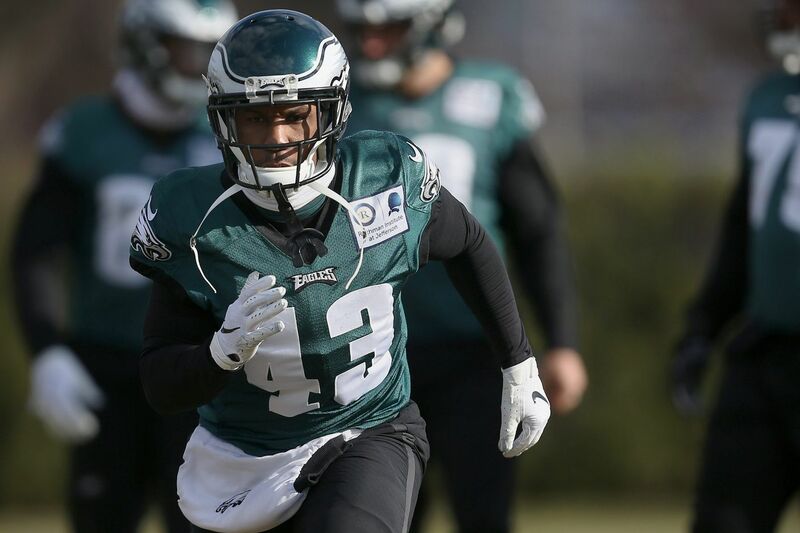 Sproles, 35, seems unlikely to play Monday against Washington, but he did return to the field on a limited basis. He last played in the season opener against Atlanta. The Eagles seem likely to get corners Sidney Jones (hamstring) and Rasul Douglas (knee) back for this week's game, but corner/safety Avonte Maddox (ankle/knee) and corner Jalen Mills (foot) remain day-to-day, Eagles coach Doug Pederson said. Middle linebacker Jordan Hicks (calf) isn't quite that close, Pederson indicated. "He so wants to be on the field, so bad," Pederson said of Sproles, who postponed retirement after missing most of the Super Bowl season with arm and knee injuries. "Regardless of what happens after the season, he's such a competitor and leader of this football team, and he wants to be out there really, really bad." Also limited Thursday were linebacker Nigel Bradham (thumb), right guard Brandon Brooks (ankle), and defensive tackle Tim Jernigan (illness). Maddox, Mills, and Hicks sat out Thursday, as did defensive tackle Michael Bennett. Bennett left Sunday's victory over the Giants with a foot problem, but he said Thursday he expected to be able to play Monday. Left tackle Jason Peters missed the workout for personal reasons, the team said. Douglas, Jones, and rookie corner Chandon Sullivan, who injured his right shoulder against the Giants, were full practice participants.